Industrial hazardous waste discharged in Binh Duong province has been carried to the neighboring province of Dong Nai, where they are thrown to the fallow. The “initiative” of carrying industrial waste to another locality has been applied for the last many months, which allows the investors to cut down the budget for environment protection. Mountains of rubbish have arisen on the areas which were once the stone mines and they have been left fallow after the mining finished. The land areas in the two communes of Hoa An and Tan Thanh in Bien Hoa city prove to be the ideal places for rubbish. The visitors to Hoa An and Tan Thanh would immediately botice the rubbish smell right after they set foot in the areas. The unused stone mines have been full of rubbish, including industrial hazardous waste. Sometimes, the strong winds disseminate the rubbish to neighboring areas and to residents’ homes. Local people say the trucks carrying rubbish come to the areas three or four times a day, where they throw rubbish into the dumping grounds and burn it. As such, local people not only have to breathe with the bad odor from the rubbish every day, but also suffer from the smoke from the burnt rubbish. “It’s terrible. I always feel dazzled with the rubbish smell. I am considering leaving the land,” a local resident said. He went on to say that the biggest danger is not the terrible smell, but the environment pollution. More seriously, the mountains of rubbish would dirty the water resources, thus threatening the lives of local residents. The police here said they have been making every effort to stop the problem, but the situation remains unimproved. 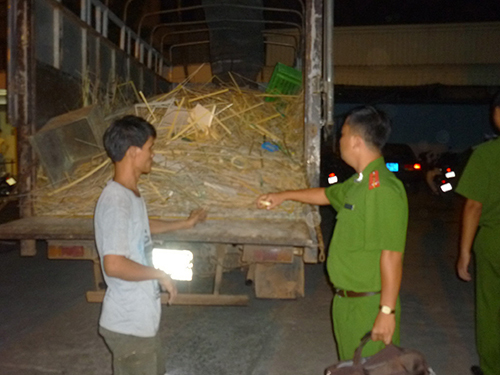 Most recently, Vu Xuan Truong, 31, was caught red handed when throwing rubbish, said that he did this work for a person in Di An Town of Binh Duong province, who paid 800,000 dong for every truck of rubbish. Some months ago, Le Van Thu, 30, who was also caught red handed by the police, admitted that he was hired by a man named Nguyen Van Huu, the owner of a big scrap iron shop in Di An town. As such, Thu and Truong are just the hired workers, while their employers are believed to be the “garbage bosses” in Binh Duong province. The problem is that Binh Duong province has been witnessing an overly hot development over the last many years. The industrial zones in the province discharge big amounts of rubbish every day, but they are not capable enough to treat the waste. The industrial zones sign contracts with private enterprises on treating the waste. However, the enterprises only receive money from industrial production workshops, but do not spend money to treat the waste. They try to throw garbage to the neighboring areas to avoid their responsibility in dealing with the rubbish. Local people said there are at least two rings of illegal rubbish discharging, including the one headed by a man named Hung, who specializes in dealing with the rubbish from the Song Than industrial zone in Di An Town. The second one is a company headquartered in the My Phuoc Industrial Zone.